Plus, I had an extra happy buzz all weekend because my mom, Judith Jolly, flew all the way from Florida to join us. Everything is better with Mama around, right? 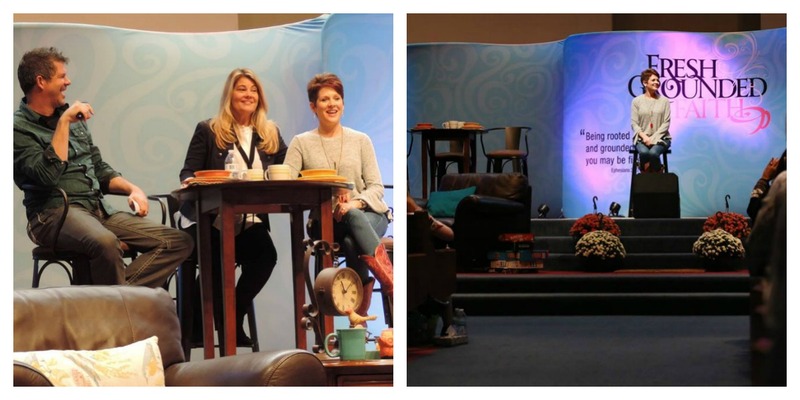 Karen Abercrombie played Miss Clara from the movie, War Room, Lisa Whelchel shared about her time on Survivor and how God’s grace sustains her, and Michael O’Brien made us laugh and praise and sing our hearts out! A big thanks to The Rock Church of St. Louis, all of the co-host churches, and the many generous volunteers who helped to make the weekend wonderful for the women. For example, our facility team lead, Rich, worked so hard. He set up and took down and packed up and loaded … all with a positive attitude. He was probably in his 70’s. We had became such good friends by the time the conference ended. I learned that our Local Conference Coordinator, Melissa Davidson, works full time, goes to seminary, teaches two Bible Study classes, and, somewhere in the midst of all that, she led Fresh Grounded Faith as the Local Conference Coordinator! She inspires me! I got to meet Melissa’s 11-year-old daughter, Haley. She asked her mom how much the conference cost because she wanted to come! Can you believe that?! Of course, that cutie pie got a ticket from her mom, and when I learned about her interest in being at FGF, I gave her Me, Myself, and Lies for Young Women. Haley told me over breakfast, “Miss Jennifer, did you know that my name was the first word in your book you gave me?” Her mother knew that the Lord intended for Haley to be at this conference—her first, but not her last! I also got to meet a group of military wives from Fort Leonard Wood. Oh, they inspired me! They are serving their country right alongside their husbands. I got tingles when the whole auditorium of women stood and applauded them to say thank you for their service. Seriously, what a great spirit this weekend! What great people! And God did amazing things! We celebrated 8 new sisters in Christ, 41 women who chose to renew their commitment to the Lord, and 24 children sponsored through Compassion International. I taught from Psalm 23, and all I can say, sisters, is that my cup runneth over! The people in St. Louis blessed me until my heart was full to overflowing. Were you with us in St. Louis? Please share your favorite part of the weekend in the comments below.